In order to continue supporting RSS Ticker, I had to remove a few features in version 13. Feel free to downgrade to version 12, but it won’t be compatible with Firefox as of Firefox 22. What hasn’t changed? 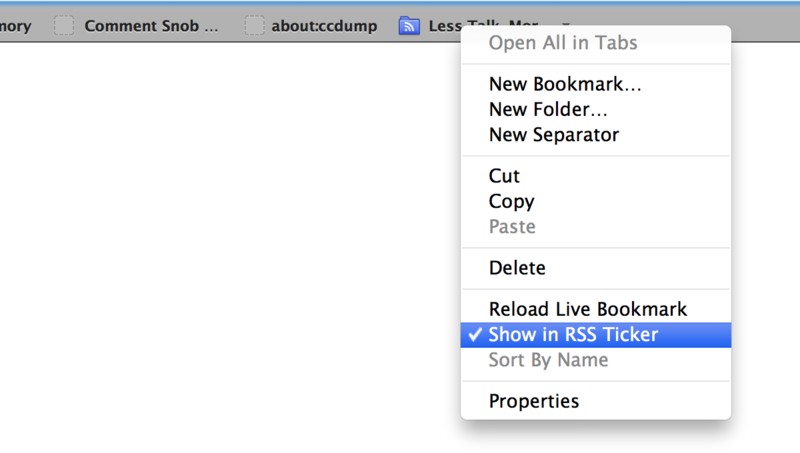 RSS Ticker will still scroll your feeds in your browser. You can still choose to put it at the top or bottom of your Firefox window. You can still exclude specific feeds. You can mark as read, mark feeds as read, open in tabs, open all in tabs, etc. You can temporarily disable the ticker. You can change the ticker speed, smoothness, and direction. You can hide the ticker automatically when it’s empty. Specify how often the feeds should refresh. I know some of you liked and used these features. I’m sorry I had to remove them, but it was the choice between removing them or abandoning the add-on altogether. 1. All of the remaining options (six of them, down from a total of 37) are displayed inline in RSS Ticker’s section of the Add-ons Manager. 2. If you want to temporarily disable the ticker, just uncheck it in the View > Toolbars menu. But, I’m sorry RSS Ticker is not working anymore. There is no toolbar button anywhere to find. Also if you check the option to show the ticker, no feeds are shown. So I had to revert to version 12. Hope you can fix these issues in version 13. You may need to wait a few minutes for your feeds to update the first time. Fair enough, but can you give us a hint towards why you had to remove all these nice features? Basically, they take time to implement (since I had to rewrite the add-on), and they take time to maintain each time a new version of Firefox comes out. Without the option to choose how often the ticker refreshes, it is useless. Had to revert to version 12. I will be looking for an alternative. RSS Ticker was great for the past couple years anyway. I’m sorry to read that the maintenance of RSS Ticker has become too much because of FF requirements or FFs inability to offer a stable API. I personally hope that you will be able to continue maintaining and creating new functionality in RSS Ticker, I can live with the current features and capabilities, don’t let yourself be discouraged by some disgruntled users; you can’t win them all. I’m not faulting Firefox for their API changes — it was stable for seven years, and the changes that Mozilla made make complete sense. It just happens that I don’t have the same time to work on it now that I had seven years ago. I’ve only been using this add-on for about 2 years. I moved onto chrome back then to see what lal the fuss is about but the lack of good add-ons (and a few other things) moved be back to Firefox. While on Chrome they had some great RSS add-ons and I was very depressed when Firefox did not offer anything similar. Then I found your add-on. I just wanted to say thank you for doing this for so long, and for continuing to do so. This is definitely an add-on I cannot live without! So, whats the interval now?! Looks as if the ticker is going to be useless. What a pity, I’m already checking for alternatives. Is there a way going back to version 12? By default, all of your feeds will be updated at least once after two hours. The longest time between two feeds updating is eight minutes, but in future versions, that interval will be determined based on how often each feed is updated. But a warning: that version will stop working in the next Firefox update, which is why I had to rewrite it for version 13. Thanks for making the effort, i am a new user and i love the feeder. I’m ok with all the new changes, I understand you don’t have enough time to re-implement all of these features but there is one big feature that went away and I don’t see it listed here, it’s the possibility to select which rss category to add to the ticker. Is this gone for good ? I’m not sure I understand. What do you mean by “rss category”? RSS Ticker uses your browser’s history to determine which ones were read, so if you clear your browser history, you’ll be clearing your ticker’s history too. Thanks again for all you do Chris. I am signed up for your emails now. Thank you for such a useful and wonderful product! The feed keeps popping up for me (with the same items) even though I clicked all the items OR right clicked it and marked it as “all read”. I use FF21.0 on Windows Vista. What’s the URL of the feed? This is Firefox 21 on Win7. Thanks for reporting it. I’ll try and get that fixed ASAP. for the majority of us. Thanks to Chris for his work all the years, anyway. So what are your alternatives? I just wonder why its such a huge additional effort to maintain a customizable update interval, which is a core feature. Now RSS Ticker is like a car without a stirring wheel. Anyway, you will have your reasons. Give the author a break, he did this for free and for love for 7 years, he deserved his sabbatical. You may want to take it upon yourself to write a super addon. I would love the feature to have the feeds update more often. This was actually making me money (getting updates before other people etc). I was dependent on that feature. If you bring it back I promise will donate. Thanks in advance! Hi Chris – From here in NZ. I’ve been a fan for your expertise on this ticker from just about the beginning. Well done. I’m currently on Debian based Linux OS and FF20 on the current release channel… FF has been my stable platform Browser since way back. In the old days when I used Windoz (10yrs ago) – I used Opera. For me the changes make no significant difference. The bar still works great. Many thanks for the “spare time” you give to this. I’m now sub’d on this blog. 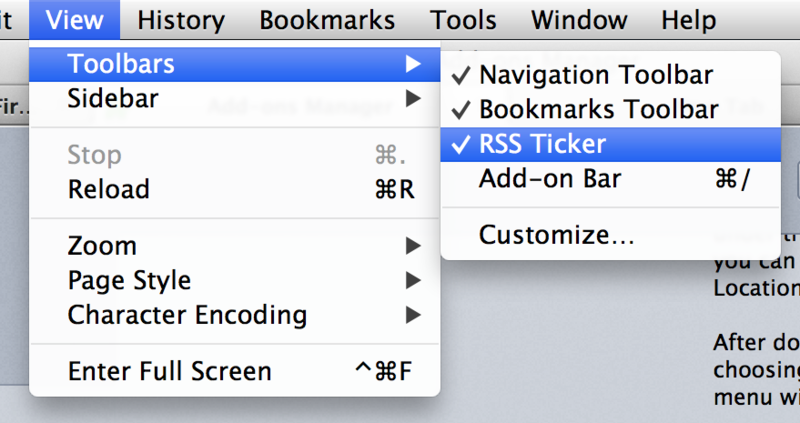 I’m sorry to hear that you can no longer maintain some of the features of RSS Ticker. Sadly, the removal of some of those features (feeds limit & customizable refresh schedule) makes this add on of little to use to me. I have reverted to version 12 for the mean time and am looking for other options. Thank you for all the hard work and time that you’ve put into this add-on, it was fantastic for such a long time. Yeah, I’m sorry too, but it was either this, or let it stop working entirely once Firefox 22 comes out. I think this is better than that. Hopefully in the future you’ll be able to find a way to add some of these features back in. Also DAMN. Every single entry from every single RSS feed I have has come back to say hi. Now I have no idea what I have read and haven’t. Yay. Looooooong entries are pretty silly to watch passing by. At least when you can’t add an width option you should consider condensing them to a reasonable size, e.g. 50% of now !! really nice add-on – using it for 4-5 years now. THANKS! BUT: Since your recent updates the RSS feed of ebay seems to fail – since last night I got all news from ebay since… now we are at june 2012 and still ongoing. Before… I usually got one or two news a week from ebay… not nothing seems unwritten. I’ll take a look. Is it a feed for eBay listings? If you can post the exact URL of the feed, that would be most helpful. I’ll look into this; thanks. I use RSS Ticker since long time ago. To improve the usability of the addon to me, is recognize where a feed ends and a new one start. Please could you add an option to mark the boundary of each feed in the ticker. A simple and narrow dark bar could be enought. 3 days ago it worked fine… what happened? Do you have Firefox configured to clear the history each time you restart? Thanks for RSS Ticker up to now Chris. It’s been a great little tool, but the changes render it useless to me and the history bug is annoying as hell. Oh well, looks like I need a new ticker util ? Don’t make the same mistake I did. Now I have a unstoppable repeat of ebay information pages in German. I deleted my browsing history, deleted and reinstalled the add-on, and restarted the browser. Nothing seems to get rid of these feeds. The changes do not bother me, but I would love to only the feeds that I have subscribed to. Thanks for your efforts to keep the plugin alive! I do not want to waste your time and I fully embrace the sensibly chosen simplifications to support easier maintenance. – My Ubuntu installation has the same issue. Additionally the ticker is to low and cuts of the ticker text on half height, which makes the ticker unreadable. – In older version RSS ticker with many feeds seemed to block FireFox at startup for seconds. Felt like it was trying to update all feeds at once. v13 avoids this, right? – Ctrl-Mouseclick is fine, but I always missed to mark entries read purely by mouseclick (i.e. middle). Would it hard to achieve this? * My Ubuntu installation has the same issue. Additionally the ticker is to low and cuts of the ticker text on half height, which makes the ticker unreadable. Valid bugs. I’ll get them fixed. In older version RSS ticker with many feeds seemed to block FireFox at startup for seconds. Felt like it was trying to update all feeds at once. v13 avoids this, right? Ctrl-Mouseclick is fine, but I always missed to mark entries read purely by mouseclick (i.e. middle). Would it hard to achieve this? This was removed accidentally. I’ll get it back in. I’m a dev myself and I know how it can be really discuraging if people only write a comment when they have a question or want a change, esp. on stuff that needs updates all the time, so I wanted to use the chance to just say thanks. I used this addon now for a long time and it just does what I want it to do. Thanks for taking your time to make this addon and keeping it updated! Thanks for your work on this great add-on. As a many year user I say thanks. As a fellow developer I can understand the time issue but I wish you could have asked for help or something before gutting the product. Anyway, the purpose of this report is that with Ubuntu/ Gnome Linux and the just updated version of Firefox and your plug-in, only the top halves of the text boxes show. Enough to be readable so it’s not an emergency but it is something you might want to look at. Anyway, the purpose of this report is that with Ubuntu/ Gnome Linux and the just updated version of Firefox and your plug-in, only the top halves of the text boxes show. Enough to be readable so itâ€™s not an emergency but it is something you might want to look at. I’ll get this fixed. I didn’t have a Linux box available to test on, but I’ll get one set up. My favorite add-on! Thank you very much for continuing to support it – great job. Thanks for keeping it up for as long as you did. You are THE MAN. So sad to hear the news, what an incredibly useful add-on this has been. Hopefully, someone else will maintain this add-on in the future. Thanks so much for creating it. Thanks for all the years I enjoyed this RSS Ticker, they have been great. Sadly with the inability to update feeds every minute it no longer suits the purposes I was using it for. Is this one feature that impossible to code and maintain? It was the one thing that really set this addon apart. Regardless, thanks for all you have done in the past. It’s not that it’s an immense amount of work for this one feature, but since for every feature there’s somebody saying “Is this one feature that impossible to code and maintain?”, I have to choose which ones are important enough to continue supporting. Manual feed updating doesn’t make the most sense, since each feed should only be updated as often as it includes new content, and that’s something that we can figure out automatically. I really love this add-on, and I understand why you’ve had to make certain changes. I’ve opted to stay with version 12, but I am constantly re-upgraded to 13 when I start up Firefox. I know I’ll have to go to 13 sometime, but what’s with all the forced updating after I’ve downgraded? Double-click does zilch. Options menu does not provide a “no update” option. Using Firefox v.23. Do I need to /also/ downgrade the browser, too? Jeesh! I’m still using version 12 and recently the little icon that displays next to each item has gotten screwed up. they’ve always been problematic in that some times it just wont display the icons, but now its displaying the wrong icons. for example I have feeds for http://www.theregister.co.uk, http://www.theenquirer.net and one for http://www.arstechnica.com, at first the feed for The Register displayed an icon, then stopped after a month or so. the feed for Ars Technica displayed its icon for several years and did The Inquirer. Then about a month or 2 ago Ars Technica stopped displaying its icon, now Ars Technica displays The Inquirer’s icon. Utterly useless RSS addon when you cannot limit each subscription to a maximum number of, say 10 or less. You’re driving all your appreciative users away! I agree with Rick Cummins. All these responses clearly show one thing: there is high demand for the Ticker as it was. People are now quite comfortable with there being a free lite version of apps and add-ons, plus a paid full version. How many hours’ work do you estimate you need to put in for each Firefox update? Do some maths – how quickly could you pay yourself a decent fee, if you charged a few dollars to each user? I miss the lost features, and would happily pay to have them back – I know that many others would too. A big thank-you for all your efforts so far! …Also – I have the same issue, where ALL past entries from ALL feeds start scrolling again every time I open Firefox. You say this is a result of privacy settings that clear browser history on closing Firefox. But I have been using such settings since I started using Firefox – the old Ticker didn’t mind that I cleared my browser history on quitting. Do you have any tips about how I can get around this?